Bramham Village Hall has hosted a weekend of village events dressed in a marquee that transformed the hall into a magical setting. On Easter Saturday Nicola and Stephen Finkle of Low Way in Bramham transformed the village hall into a marquee venue and celebrated their marriage with 150 family and friends. Alison Mackie ( a member of Bramham parish council) came up with an idea to use the marquee to create a village event. The bride and groom kindly agreed to offer their marquee facility to the village community groups to put on an Easter Sunday celebration. Lisa Revolta from Bramham Discoverers took up the challenge to organise the event and pulled together teams from the church, the village hall and the NSPCC to put on the event that included afternoon tea, easter egg hunt in the church yard, face painting, easter quiz and easter bonnet parade judged by Nick and Rachel Lane Fox. 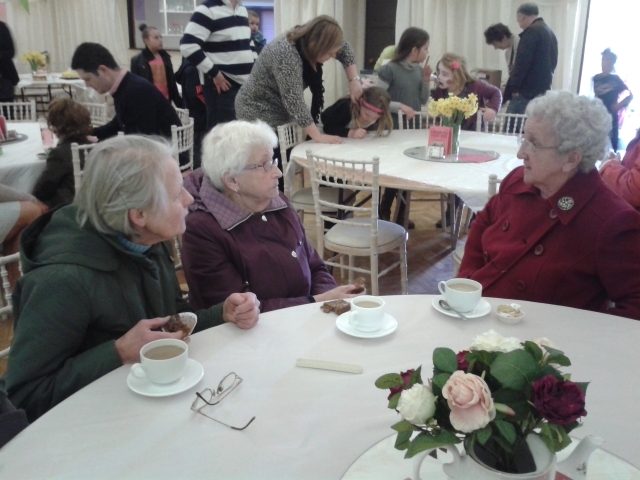 Reverend Stanley Menzies from All Saints Church in Bramham commented, “It was so lovely to see a wonderful traditional family event take place in our local village hall and bring together our community to celebrate easter sunday”. The Village Hall is used for many events and with its brand new toilets and excellent catering facilities it is fast becoming a very popular event facility and has bookings for most weekends throughout the year. For more information, or to enquire about booking the hall, please contact, or on 07432 330972.